Choosing and arranging your oil painting palette is not a difficult task. Artist make their own selection and arrangement of colors (or tones) and establish relationships that may seem very strange to other artists but which happen to suit his own working habits. Whatever the colors finally selected for your palette, they should be systematically arranged in some particular order so that you will be able to reach for the right pigment and find it whenever you want it without fumbling. Many artists speak of their oil painting palette arrangement as being like the keyboard of a piano each note or tone in a particular spot in relation to all the other tones. However, artists' palettes are very different from keyboards in that each artist makes his own selection and arrangement of colors (or tones) and establishes relationships that may seem very strange to other artists but which happen to suit his own working habits. There are really no rules aside from convenience but many artists find it most helpful to base their arrangement on the spectrum. In such an arrangement, the reds come first, then the oranges and yellows, next the greens, blues and violets, and finally the browns, blacks and whites. In another common arrangement the warm colors and the cool colors are placed in separate groups. This type of grouping is used in the two palettes shown aboveone a basic palette and the other, a more advanced palette. Another scheme is the grouping of colors which are frequently used in combination. 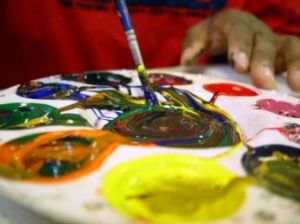 Jerry Farnsworth, whose list of suggested colors was given previously, arranges his oil paints on a rectangular thumbhole palette with Zinc White in the upper left-hand corner. Across the top from left to right are the cadmiums from pale yellow to deep red, then the earth colors. Down the left side of the palette are Alizarin Crimson, the blues, Viridian and black. The center is left free for mixing. A useful trick used by some painters is to make several dabs of each color on the palette rather than one large one. This makes it much easier to keep each color particularly white and light yellows clean and clear.